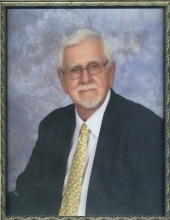 Irvin Daniel Giedd, 85 of Eatonton Ga., passed away on March 29, 2019. A memorial service will be held at 2:00PM on Wednesday, April 3, 2018 at First United Methodist Church of Eatonton. The family will greet friends one hour prior to the service. Mr. Giedd was born on December 15, 1933 in Avon, South Dakota to the late Daniel and Margaret Stolz Giedd. He was a retired Veterinarian sales rep. for Schering, a member of Eatonton First United Methodist Church and Robinson Dance Sunday school class. Mr. Giedd was a veteran of The United States Army and a master gardener. He enjoyed bowling, fishing and spending time with his family. Mr. Giedd was preceded in death by his brother and sister. Survivors include his loving wife of 61 years, Barbara Giedd; sons, Derek (Ann) Giedd and Greg (Carol) Giedd; grandchildren, Joel Giedd, Kimberly (Kristopher) Sampson, Neal (Sindhu) Giedd, Alycia Giedd, Matthew Giedd, Tara Dunn, Evan (Jenny) Dunn and Julie Dunn; great grandchildren, Judah, Caedon, Valen, Esther, Naomi, Maia and Jules; sister, Irene Cahoy; and numerous nieces and nephews. In lieu of flowers donations may be made to Eatonton First United Methodist Church, 103 W Magnolia Street, Eatonton, Georgia 31024 or to Kindred Hospice, 855 Gaines School Road, Athens, Georgia, 30615. To send flowers or a remembrance gift to the family of Irvin Daniel Giedd, please visit our Tribute Store. "Email Address" would like to share the life celebration of Irvin Daniel Giedd. Click on the "link" to go to share a favorite memory or leave a condolence message for the family.